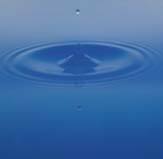 Regardless of the region, watershed development has the greatest impact on water quality. The Indian Creek watershed is no exception. Growth in this area of Lake County has taken it's toll on our streams, wetlands and rivers. The county has an ordinance in place to help minimize impacts on our land and water resources as developments are built. Communities across the nation have discovered that they must work at the watershed level to solve their diverse water resource problems, especially once the land is developed. They have also found that no matter what watershed they are working in, the same eight basic management tools are needed to mitigate the impacts of development: watershed planning, land conservation, aquatic buffers, better site design, erosion control, stormwater treatment practices, control of non-stormwater discharges, and watershed stewardship. These are some of the best management practices that have been implemented in the Indian Creek Watershed for the betterment of Indian Creek watershed's water quality and its natural resources. 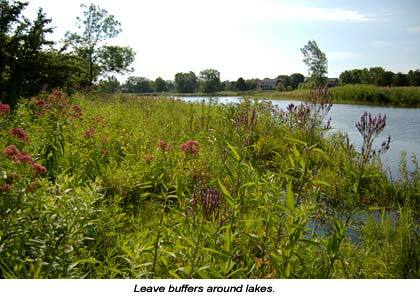 Maintain buffers along streams and lakes. Do not mow up to the shoreline. Leave as much natural buffer as possible, optimally 15-20 feet or more. Plant roots, especially deep rooted native plant roots, help to preserve shorelines by holding soils in place even during flooding. Preserve wetlands and wetland buffers.Wetlands are the best flood prevention we have. By nature these areas have hydric soils and native filtering plants that soak up a lot of water and help to absorb pollutants. We need to carefully plan to preserve and restore these vital water bodies. 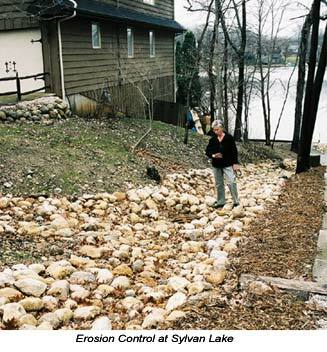 Erosion control structures along stream and lakeshores help to minimize soil loss and erosion. Soil and sediment is filling up our wetlands. Wetlands cannot function properly if they are too shallow. Most threatened and endangered species in Illinois rely on our wetlands as habitat but we are losing them at an alarming rate. In-stream structures are important in problem areas of streams. Materials like rock, logs, erosion control fabric, and brush fascines help to keep soils in place and minimize sedimentation. Channelized or straightened streams occurred as areas were farmed. Historically meandering streams were nature's way of slowing down fast moving water. Sediment would be deposited along the turns. Plant native species. 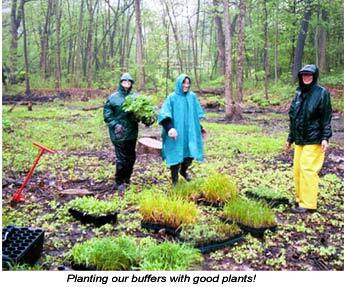 Native Illinois plants are indigenous to our region; they were here hundreds of years ago. They have very deep roots and have adapted to survive our harsh weather. They are drought tolerant, which means they need less watering, and they have other interesting qualities that are important as food and habitat for birds, butterflies and other fauna. Many native species benefit from prescribed fire during dormant periods. Control invasive and exotic species. Invasives - or exotic species were introduced by settlers or other outside sources. However, these species have learned to adapt so well to the Illinois landscape that they are taking over our natural communities at an alarming rate. This loss of diversity has had a devastating effect on natural areas which is why high quality species become threatened and endangered. We must control invasive species because they have no natural enemies to keep them managed. It is important to pull, herbicide, or burn invasives like reed canary grass, purple loosestrife, buckthorn, garlic mustard and others. 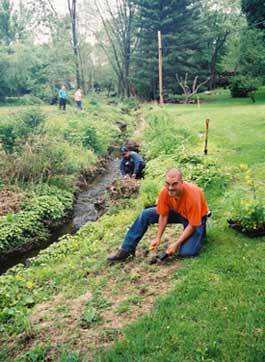 Trained contractors and volunteers have helped manage invasive species on various projects throughout Indian Creek. Invasive fish like carp have taken over lakes and streams and they are over-populating our lakes and streams. Do not release bait fish into our waterways, please. Protect floodplains and floodways. Do not allow building within floodplains because they flood. Rivers overflow their banks in our area even several times a year, this is a natural process during spring rains and other heavy rainfall events. By prohibiting development in these areas planners can prevent many problems and save thousands of dollars. Other best management practices are also important. Techniques like minimizing salt use in winter, keeping garbage off roadways and out of streams, natural swales along roadsides or minimizing curb and gutter, retrofitting detention ponds that need to function better, and especially getting involved in watershed planning in your area are ways to really help conditions in your watershed.